There’s nothing worse than getting ready for a nice, hot shower, only to be greeted with an icy wake-up call. If your water heater isn’t working up to snuff, you’re sure to be left cold. 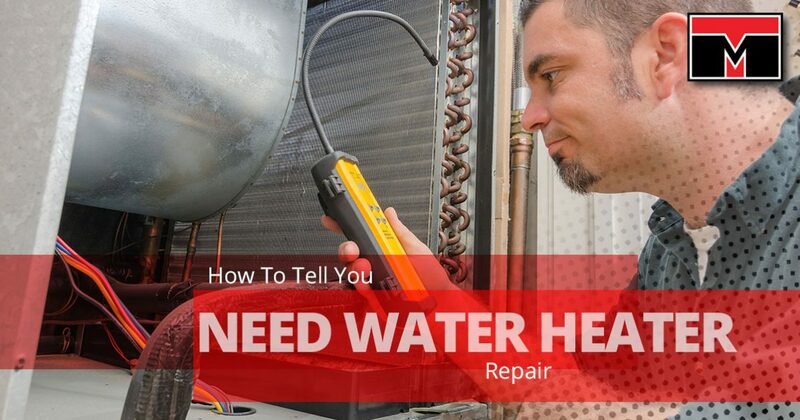 How can you tell your water heater needs to be repaired? We’ve gathered some of the biggest warning signs that will let you know if repair is necessary so you can approach the situation with knowledge. If you’re experiencing one or more of these symptoms, call Tippetts Mechanical to schedule your water heater repair to get back to normal. Probably the surest sign that something is wrong with your water heater, you’ll notice this if you seem to run out of hot water during a shower much faster than you used to. This typically means your water heater is losing heating power, reducing the amount of water it can properly heat. If this is happening, it means you need a repair, or if it is old enough, you may need to replace the water heater entirely. One of the most striking signs is to see is brown water trickling out of the faucet when you’re looking for hot water. This is usually a result of too much sediment inside of the hot water tank, though it may also mean corrosion has set in, which we’ll discuss in more detail below. To avoid a build-up of sediment, it is recommended you drain the water through the water heater’s drain valve once a year to prevent irreversible damage. If you are unable to drain the water out, it means too much sediment has accrued, meaning a repair is no longer possible, and replacement will be necessary. When you hear a rumbling sound you might think your water heater is about to lift off into the stratosphere. Thankfully, the problem is not quite that extreme, but it still isn’t something to ignore.This can mean anything from an increase of water pressure within the tank, a broken expansion tank, or cold and hot water mixing due to a broken dip tube. As soon as you hear this sound, it’s a good idea to contact a professional to inspect it. If you ever see water pooling around the base of your water heater, it is imperative you contact a professional to assess the situation. The pressure relief valve is the only area water should drip out from, so if you see water dripping in any other area, the problem needs to be fixed quickly before it can get worse. It’s recommended to replace a water heater every six to 12 years, as that is a typical expected lifespan for a unit before it will start to break down. At this point it is important you keep a close eye on your water heater to ensure you avoid costly water damage from a broken tank. If a water heater receives regular annual maintenance, they are designed to resist corrosion for most of their lifespans. However, if the water heater begins to show signs of corrosion, it may be able to be repaired by replacing whichever part is corroded (i.e. the heat exchanger). While that may be possible, corrosion is usually a sign of a larger issue, meaning the whole water heater would need to be replaced. An operational water heater is vital to maintaining the quality of life for you and your family. If you have experienced any of the issues we listed above, please call Tippetts Mechanical today to schedule an inspection, routine maintenance, repair, or replacement of your water heater. It’s about more than just a hot shower and clean dishes; it’s about the safety and comfort of your household. We hope to hear from you soon.